A visible image of Blas from NOAA's GOES-West satellite taken on July 7 at 1200 UTC (8 a.m. EDT) revealed the eye opened wide. 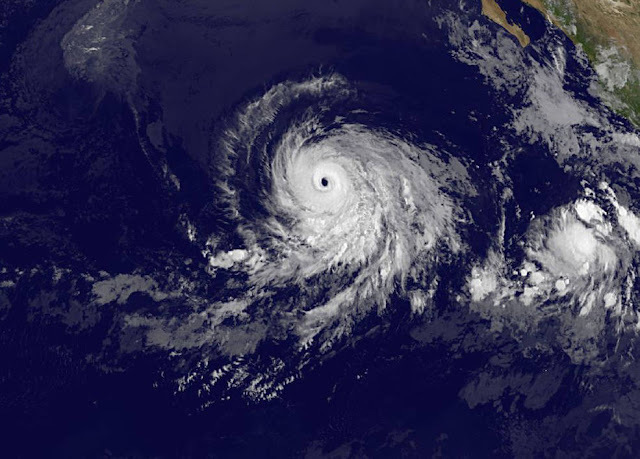 Hurricane Blas has become a Category 3 or major hurricane, the first of the season for the East Pacific Basin. Blas is currently centered about 1,175 miles west-southwest of the southern tip of Baja California, with maximum-sustained winds of 125 mph, reports Accuweather. The storm continues to move through a region of weak wind shear and very warm ocean temperatures. These favorable conditions will support maintenance of major hurricane status or perhaps even a bit of strengthening over the next 6-12 hours. The cooler sea-surface temperatures and increased shear experienced will cause Blas to weaken starting later today and into Friday. The hurricane should weaken to a minimal hurricane on Friday and then weaken to a tropical storm on Saturday. Further weakening will cause the tropical cyclone to degenerate into a remnant low on Sunday or Sunday night. Blas will remain well away from any landmass.